From Jerry Lee Lewis and Little Richard to Billy Joel and Elton John, the piano has been a big part of rock and roll history. 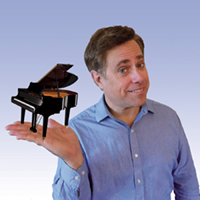 Second City alumnus RANDY VANCOURT (Bring The Piano) returns to the Winnipeg Fringe with his new show TUNED. Blending some of pop music’s greatest piano hits with his own brand of comic storytelling, he spins a musical tale of one pianist’s journey through the rock decades. Come take a trip down rock and roll history with Randy Vancourt. Vancourt is one part museum curator, one part entertainer and spends his show talking about music history while playing the legendary songs that make up that history. He is incredibly knowledgeable and there is no denying how talented he is. He plays that keyboard like only an expert could. I was one of the youngest audience members at 25. I found this became obvious when several jokes flew over my head that everyone else seemed to get right away. Most of the songs were older and a lot of the references were before my time. Vancourt is kind of like your one friend’s dad who knows a ton about one subject and talks about nothing else anytime you visit. You know the jokes are bad but you laugh anyways because he’s just so likeable and entertaining. Not my favourite of this fringe but worth a watch if your also interested in rock music history.